On June 6th, 2016 Robert “Bob” Williams was blessed with a lifesaving kidney and liver transplant. He is recovering in the ICU at Methodist San Antonio Medical Center, and as each day passes, Bob is making progress towards a full recovery. Prior to his transplant, Bob had suffered a very long time with both end-stage-renal and liver disease, but he finally received the telephone call that would save his life. Bob’s transplant was lifesaving, but his out-of-pocket medical expenses are quickly adding up to more than he can handle on his own. Co-pays, deductibles, medical bills, caregiver fees and living expenses are quickly adding up. Bob requires costly post-transplant anti-rejection medications to halt rejection that are needed for the rest of his life. Bob needs our thoughts and prayers, but is also in great need of our financial support while he recovers from his transplant. Bob was born and raised in Clawson, MI where he lived for almost 40 years. After moving to Boyne City, he met and married his wife, Micki. They now live in Canyon Lake, Texas. Bob made a living working hard in the auto body and paint business for over 35 years. When Bob was 62, he retired and his love for stock car racing allowed him to work as the flagman at a small asphalt track called Northern Michigan Speedway. Bob never missed a Saturday and that continues to be something he is passionate about to this day. 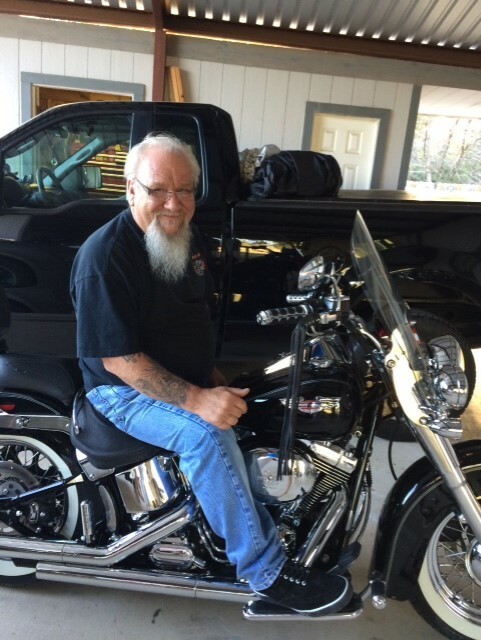 Bob loves to ride his Harley Davidson and he wouldn’t be without it as he has been riding motorcycles since. Bob loves to collect and play guitar and is an avid musician. A true family man, Bob loves his family and has helped his wife raise her three children from a previous marriage. Since they were very small, Bob was a father figure to them, and proved to be a wonderful, caring and loving father, husband and person. While Bob recovers from his surgery, he looks forward to spending more time with his family and doing the things he loves to do best. To help with the financial burden of Bob’s out-of-pocket transplant expenses, a fundraising campaign in his honor has been established with Help Hope Live, a trusted nonprofit organization that has been providing community-based fundraising guidance to patients and their families for more than 30 years. All donations are tax-deductible to the full extent allowed by law, are held by Help Hope Live in the South-Central Kidney/Liver Transplant Fund, and are administered by Help Hope Live for transplant-related expenses only. To make a donation to this fundraising campaign, click on the yellow DONATE NOW button. For more information, please contact Help Hope Live at 800.642.8399. Thank you ahead of time for your thoughts, prayers and financial support. Any donation amount is one step closer to a brighter future for Robert and his family. Bob is in ICU and awaiting the organs he needs. Please pray for him and his family.